Operational Performance Improvement (OPI) is anything focussed on improving your Operating Model. If your Business Model determines what you do for whom and the value that it is worth. 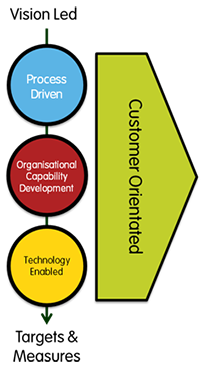 Then the Operating Model focusses on how you deliver the best possible customer experience while maintaing a sensible business cost base, ensuring that you remain profitable. To that end, it will generally involve Processes within the organisation, People and roles who operate within the organisation and any Tools or automation that may be useful to the organisation. All these should be aligned in service to some very specific, customer oriented goals. We believe in delivering sustainable results. We do this by working alongside your team to transfer skills and ways of working. We have a number of tools and techniques that allow us to spot improvement opportunities; implement and measure changes; leading to an effective return on investment in achieving your goals. Our approach allows us to rapidly diagnose and implement operational improvements across your organisation. Our clients tell us we are different because of the importance we place on engaging with people and developing trust at all levels of the organisation. We can deliver a focussed piece of work that looks at one or more of your business processes. We use our process analysis tool v-Flow to provide detailed insight at rapid pace. Our clients tell us that what impresses them is that the recommendations are not high-level, but detailed and actionable. We can provide added expertise in process design and change management as well as project planning and delivery. We can do this directly, working with you, or we can provide simple training, coaching and/or facilitation support to help your own team gain these skills and carry on the work after we are gone. In most instances an engagement involves all elements of these options. The best thing normally is to have a chat with us about what you are looking to achieve and we can see what works best from there.